Travel clothes aren’t designed to look great. That’s certainly true of the ace travel brand ExOfficio’s BugsAway Sandfly trousers, which do smack of middle age and a disregard for the effect of light-beige on everyone around you (though they are also sold in brown and blue). Still, that’s nit-picking, which, incidentally, these trousers also do. We tested it on a mozzie-infested dusk in the short UK summer, and found the BugsAway Sandfly to be pretty successful. 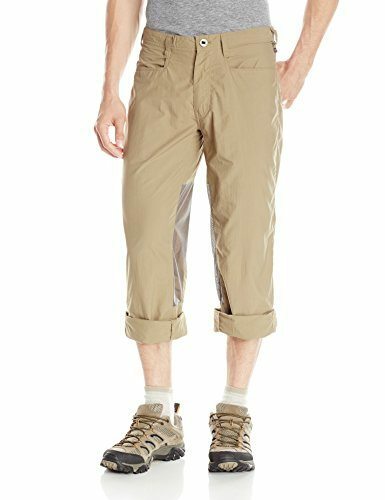 It sounds obvious, but the permethrin-infused fabric can’t do much to save your legs if you hitch them up using ‘leg snaps’ (a relatively rare feature on men’s trousers). However, just as important as all that for a pair of travel trousers is pockets. The BugsAway Sandfly does a half-decent job, offering two big deep hand pockets, two Velcro-fastened back pockets, and a ‘gadget drop’ pocket on the right-hand leg. All fairly practical, but with nowhere to keep your passport, keys or cash safe, the BugsAway Sandfly can’t be considered all-round travel trousers. Here’s a pair of airy, super lightweight, quick-drying trousers that ought to be useful the globe over. However, like many US brands, the BugsAway Sandfly appear to be designed for US travel rather than for the rest of the world, where a passport pocket would be really, really handy. However, sling them in your travel pack and where them on the beach – if you can get over the light beige curse.